Sharks with frikkin’ laser beams on their foreheads have, until now, seemed a remote possibility*. But in a stunning development, scientists have engineered living cells which are able to _emit laser beams_. Take a moment. Sit back. Allow your mind to explode a little. 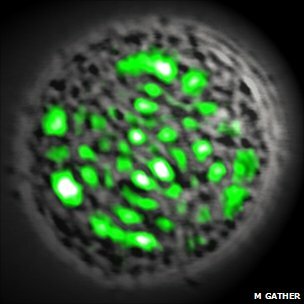 In essence, living cells have been engineered to produce Green Fluorescent Protein (GFP) – a jellyfish protein which fluoresces -and, when bathed in weak blue light and helped along with mirrors, emit an intense, focused beam of green laser light. Yes, I’m interested more in a leadership-level role. My maniacal laughing skills are superb. And I have documentation assuring people I would be a nice world leader (seriously, I do). Seth – perhaps a collaboration? Ya get ya frikken scaly bod outa my feed. Pzzzzip. …. oh, OK, good testimonials, I can see that you will definitely be a most benevolent overlord (should that be overmistress???). /replaces hat so zombies don’t get the rest of der braiiinnnzzzzz. Oh my. You *do* come highly recommended. We are well familiar with Dr Maccio’s work and his fine team at Fake Science Laboratories. Perhaps as your assistant director for Appeasment he could be set to some useful exploratory tasks in this nacent joint venture of ours? You mean Shiva might be…….reincarnated……ahem…. I think the first proof of concept my investors would like to see would involve scaling up the existing experiment. If we can get to say, 5 watts in vitro, they might begin to see the possibilities. Even cybersharks that merely act as rangefinders for shipboard artillery systems should be sufficient as a minimum viable product. The more significant challenge is probably the control mechanism. I am thinking a modified cybug – http://www.msnbc.msn.com/id/31906641/ns/technology_and_science-science/t/military-developing-robot-insect-cyborgs/ – architecture would probably give us shorter time-to-market than waiting for neurophotonic mind-control APIs ( http://www.ted.com/talks/ed_boyden.html ). The cells did not lase, they simply contained the dye. External pumping and mirrors were needed. This article was a pure puff piece, typical of Nature journals, who go for flash before substance frequently. They also *produced* the dye, which is a bit more interesting than just acting as a vessel. However, it’s obvious there’s some way to go before Dr Evil’s great vision is finally implemented. In fact, I’m pretty sure it’s decades away, maybe centuries. You’d have to be completely mad to start thinking about how to engineer Cyclopean sharks before we get the initial patents filed at this very early stage.